Agate stone or jasper stone tankard with pewter fittings and a small agate or jasper stone salt; seeking more information. Anyone seen a stein or tankard made out of agate before? I’m looking for more information on this stone agate or jasper tankard and matching small… salt cellar… (?) which came down from the Dutch side of the family but without any information, and I am hoping to learn more by posting here. The tankard and salt are made of stone, a sort of agate, I think jasper. It is a brown banded stone, and one solid carved piece. The inside unlined, of the same stone. They are not ceramic. There are no markings on the metal or on the stone. Each has a lid and a banded metal rim, I think the metal is pewter but I haven’t tried to polish it (I think it would be much darker if silver). The tankard/stein has a hinged lid whereas the salt lid comes off entirely and is not hinged. They are heavy, the stone is probably 1/4 inch in thickness. They seem to be fairly uncommon, because I am not coming across a great many agate or jasper tankards or steins through Google image search. The tankard or stein is about six inches high, holding about a pint I would think. If you have seen other similar tankards or steins made of agate or jasper, I’d like to learn more about these, so please do comment below. 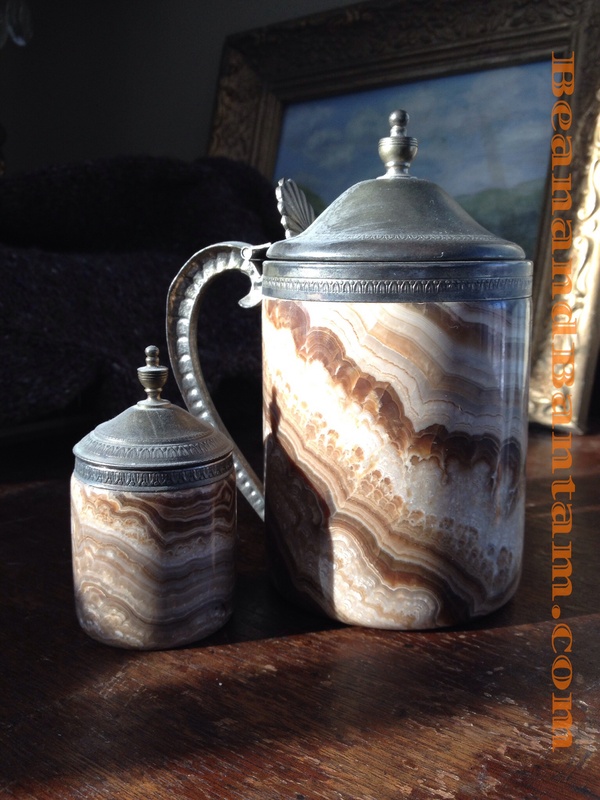 I did find a very fancy agate tankard at Bonham’s web site and an agate bowl with silver on Christie’s web site but while these are vaguely similar, they aren’t the same. I also found an agate stein on Live Auctioneers. I’ll update this post if and when I found out more. I know nothing, but they are very pretty! How lovely and mysterious! Have you tried posting to Facebook or Pinterest? A friend of a friend of a friend might know something. Thank you, I’ll definitely try posting to Pinterest, what a great idea. I think I may have tracked down the area they were made in to Germany, I’ll update the post when I know I bit more. I cannot say I’ve seen either of these made of agate before but they are both beautiful pieces.